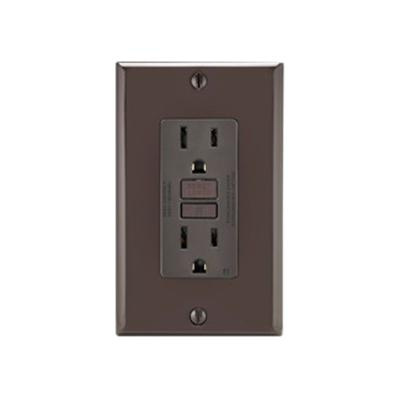 Leviton Decora® SmartlockPro® 2-Pole Non-tamper-resistant self-test GFCI duplex receptacle in brown color, has current rating of 15-Amps and voltage rating of 125-Volts. This self-grounding receptacle withstands short-circuit rating of 10-Kilo-Amps and dielectric voltage rating of 1250-Volt AC. It provides continuous ground fault protection. Receptacle automatically adapts and shifts to more frequent testing on potential problem detection. This 3-Wire receptacle has back and side-wired connection and accommodates 14 - 10-AWG wire. It has 0.031-Inch double-wipe brass contact for optimal signal conductivity. External back-wire clamps provide visual indication of proper wire seating. It offers improved immunity to high-frequency noise that reduces nuisance tripping. Advanced electronics design in the receptacle provides superior resistance to electrical surges and overvoltages. * Inventory displayed is accurate as of 04/26/2019 08:40 EDT.